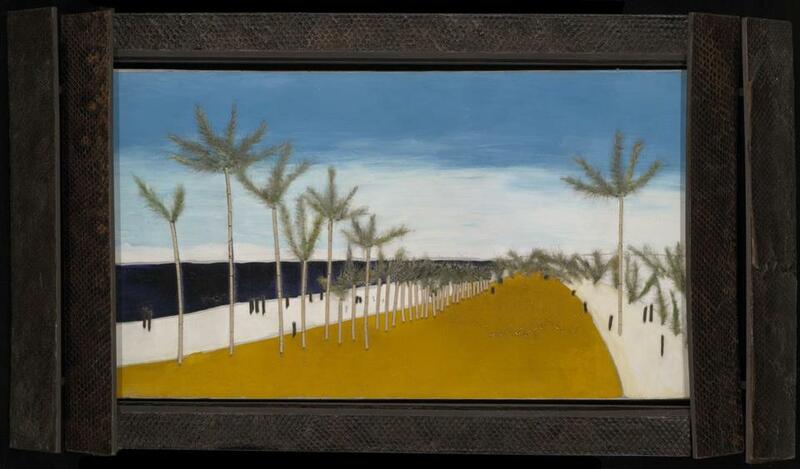 NEW HAVEN - Francis Picabia, one of the originators of Dada, made this picture, called “Midi (Promenade des Anglais)’’ sometime between 1923 and 1926. It’s on show at the Yale University Art Gallery in New Haven, where it leapt out at me largely because I’m a sucker and I like palm trees and blue sky and Nice (where you will find the Promenade des Anglais), but also because I like macaroni, I’m tickled by feathers, and I’m intrigued by the texture of snakeskin. The latter are hard to make out at first. Look closely, though, and you see that the trunks of Picabia’s palms are in fact pieces of tubular pasta joined end to end, and the fronds of his palms are feathers - presumably from a domestic duster. The frame, meanwhile, is in snakeskin. It was designed by Pierre Legrain, a furniture designer who also achieved renown as a bookbinder. Legrain made a number of frames for Picabia around this time - the heyday of Art Deco. He also collaborated with Marcel Duchamp, and was a mentor to Duchamp’s lover Mary Reynolds, herself a notable bookbinder. (Legrain’s work will be the subject of an upcoming show at Yale University Art Gallery). Picabia (1879-1953) had split publicly from the other members of Dada a year or two before making this work. He felt that the iconoclastic movement was in danger of creating a “taste’’: “I was suffocating among them. . . . I was getting terribly bored,’’ he complained. As these attitudes suggest, Picabia irremediably naughty - and therein lies the source of his art’s appeal. “The sea, the sky, the trees, the sun, the flowers bore me,’’ he wrote in a 1920 letter to Tristan Tzara. It’s hard to imagine Henri Matisse saying such a thing, which is partly why it’s amusing to think that this absurdist postcard view of Nice was made just as Matisse was settling into his own airy, Manet-influenced Nice phase. Both painters’ works seem to say: “Relax, everyone’’ - but in completely different tones. Charming and egotistical, Picabia first achieved real fame as an avant-garde provocateur in New York, where he spent much of the First World War. He cherished self-contradiction. “Our heads are round so that our thoughts can change direction,’’ he said. “The man was, in friendship, as in love, fickle,’’ wrote Michel Sanouillet, a historian of Dada. If Duchamp’s spirit presides (unwillingly, I like to think) over today’s most boring, academic art - the endless conveyor belt of found objects, space-sapping installations, and interminable wall texts - it is Picabia whose less cerebral sensibility lurks behind recent art’s most mischievous figures - painters such as Kai Althoff, John Currin, Elizabeth Peyton, the late Martin Kippenberger, and the late Sigmar Polke. Much of Picabia’s iconoclasm (and in this he was like Duchamp) was directed at painting. (“Why oil paint?’’ this picture challenges us to answer. “Why not pasta?’’) But unlike Duchamp, he kept on at painting. And it’s for that reason that his scathing, kitsch-embracing spirit has proved so influential - and so strangely heartening - for today’s liveliest painters. Picabia’s endless clowning, his macaroni madness, has proved perversely liberating, and a marvelous corrective to modern art’s parade of dogmatic movements and cultish manifestos.